We feel that it is our job to know what type and how much rain water removal system you have. Because of that we will not offer you an over the phone gutter leaf removal estimate. We're happy to come out anytime and take a walk around your home and leave you a free price quote. We'd like to meet you and discuss packages and pricing with you. 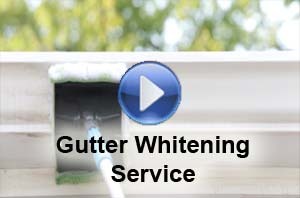 Details for our gutter packages are listed below for you to get an idea of what features will work best for your house. The factors we base our estimate pricing on include; the number of gutter feet to be cleaned, the height of the roof lines, roof slope or pitching, tree line, and whether or not you have screen guards installed. We are very thorough in our estimate process because we strive to be upfront and honest with our prices. Also the type that are installed on your home ie: (round, 5 in., 6 in., or mesh screen guarded) and other factors control the price per foot like difficulty of getting to and flushing out each of the roof lines. The more information we have, the more accurately we can price your estimate and the work. 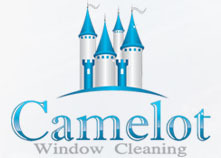 We advise most of our customers to have them cleaned out once a year after all the fall leaves come down. It's important to schedule your gutter maintenance before winter sets in completely because it it very difficult and sometimes impossible to clean out the gutters when the weather is below or around freezing. Trust us, we have tried, and it wasn't pretty. The only way to remove the full blocks of ice is to chip away at them slowly with our tools, but this is a slow and tedious process compared to our usually method and speed for leaf removal and flushing. It also increased the price drastically for a few of our customers because of the extra time required to service the gutter during those cold weather conditions. This requires a new one time estimate. 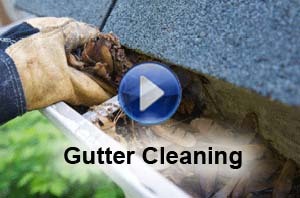 If you notice your gutters overflowing when it rains DO NOT WAIT until fall to call or schedule. They must be cleaned out as soon as possible! Water damage won't wait to schedule it's work until fall so you shouldn't either. We have some customers with heavy tree lines around their homes, these customers schedule twice a year out of sheer necessity. The leaves and pollen from the spring fill up and clog the gutters. Then the dead leaves fall off in the cold fall weather clogging them up again, so they need a second service in the same year. 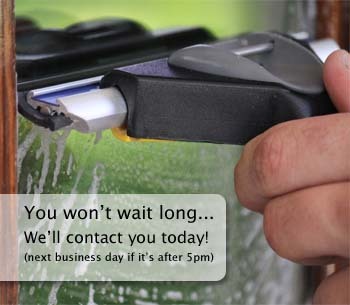 We have advised most of these customers to have screen mesh guards put over the tops of each of the trouble sections. Or some people choose to have a troubling tree removed instead. And then there are some people who would rather just pay the small price twice a year to have them serviced. The price is lower for these customers because we don't have to clean the entire rain system every time we come out. 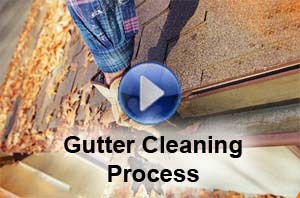 So call today or fill out our form below for your free estimate on your gutter cleaning service.